It is extremely important that volunteers are cooperative, kind, experienced or willing to learn, and possess a willingness to work together with the people and the animals in a harmonious manner. 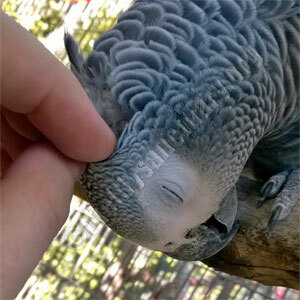 Parrots are highly intelligent and sensitive creatures and can easily pick up on any turmoil. We endeavor to maintain a positive and playful home environment for them. We are always interested in hearing from parrot lovers who are considering volunteer work in this field. We prefer people with some experience and knowledge of exotic birds, especially large ones, but it is certainly not necessary as long as you are willing to learn. Volunteers are an integral part of The Lily Sanctuary and we would not be able to run a successful operation without them. Volunteers assist in all aspects of the sanctuary including, but not limited to, daily cleaning and feeding, grounds maintenance, clerical work, repair efforts, fundraising, adoptions, community outreach and more. If daily cleaning is not your thing, there are plenty of other things that we need help with! Generally volunteers are 18 or older but if you really want to work with birds don’t let that discourage you from filling out an application. Maybe you are one of the exceptions. We ask volunteers to commit to a four-hour shift every week or every other week. Shifts are afternoons, Mon, Wed, Fri, Sat and Sun beginning at 12:00 p.m. We need at least three volunteers per day to help with the daily routine and maintenance. If you have a physical limitation that is no problem, there is plenty that needs to be done that doesn’t involve intense physical activity. 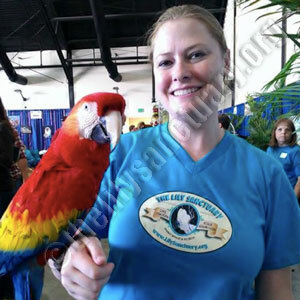 We are located in a private home in Fountain Valley, CA (Orange County) and the sanctuary has anywhere between 25 to 35 parrots at a given time. They are mostly large parrots including: Cockatoos, Macaws, African Greys and Amazons. Some parrots are available for adoption while others are permanent residents due to special needs or prior arrangements made, but they all need to be cared for equally. The atmosphere is loud, messy, crowded and chaotic, but at the same time, it is congenial and upbeat because of our exceptional volunteers and amazing birds. Our parrots are given the highest level of care including time in the sun in outdoor aviaries, daily baths if the weather permits and are fed only the highest quality foods. The first step to becoming a volunteer is to fill out our volunteer application, you will then be invited to tour the sanctuary to meet the flock and learn more about the daily activities. If you feel it is a good match you will have a full shift of training with our volunteer trainer. Whether you are looking to expand your knowledge of the species, are considering bringing a parrot into your home and would like more experience, or you are just crazy about them like us, this is the opportunity for you! Once outdoor aviaries have fresh water, all birds are taken outside to enjoy sunshine, fresh air, showers and playtime. Birds are transported outside by experienced volunteers. Every indoor cage and surrounding area is cleaned daily by volunteers. They help with collecting and changing water bowls, collecting and washing fresh food dishes, wiping down cages and scraping poop from perches and cage skirts, changing newspaper, distributing fresh food, seed, pellets and nuts. 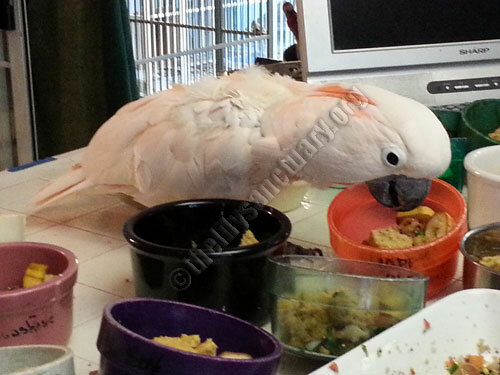 As you can see, the parrots are always willing to supervise meal preparation! There is a lot more that goes into running the sanctuary than just cleaning and washing cages. We need volunteers who can help us with a variety of outreach activities, such as the annual Pet Expo, adoption fairs, fundraising, and educational training. Help is needed to find new homes for parrots, educate parrot owners and potential new owners and recruit new volunteers. We work hard setting up our booth, transporting parrots, and talking to visitors. Most of all we have fun! or Download our volunteer application here. 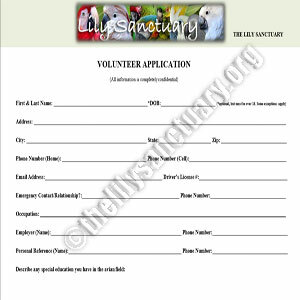 Fill it out and send it to The Lily Sanctuary. Our volunteer coordinator will contact you.